Now that we know all the college football bowl game matchups, there is keen action on scalper Web sites, such as StubHub (which has a partnership with ESPN) and RazorGator, to score the best tickets. On Monday, sellers on StubHub were asking from $750 up to a rather comical $164,710 for tickets to the Ohio State-LSU game (the latter price is for a prime luxury-box seat). The season finale Giants-Patriots NFL game might be historic; on Monday, sellers on StubHub were offering tickets for $200 up to $26,000, depending on seat location or box quality. Once the NFL playoff pairings are known, scalper Web sites will come to life for those contests, too. The asking price is not always the selling price, of course. But bowl committees and NFL teams must be saying to themselves -- if these seats really are worth hundreds or even thousands of dollars on the free market, we should be the ones pocketing that scratch. How long will it be until professional teams cut out the middle person and simply auction off tickets for whatever the market will bear? Any day now, the NFL is expected to announce a deal to affiliate all its teams with one online reseller, probably Ticketmaster or StubHub, formally acknowledging reselling as legitimate and bringing the NFL an expected annual fee in the $20 million range. This might be just the first step in converting sports-ticket selling into StubHub World. As recently as a couple of years ago, the NFL and most other sports leagues aggressively opposed all scalping. Now, pro sports is legitimizing many forms of reselling of tickets. How long until the leagues go all the way and sell their tickets directly for whatever the market will bear? That is, rather than sell individual game tickets for, say, $50, why not offer them at auction? Rather than sell a season ticket of 10 $50 games for $500, why not open an auction and say, "What do you bid?" Ticket brokering via the Internet has brought scalping out of the shadows and has civilized the idea. Now, rather than stand on a street corner near the stadium holding up fingers, you use a search box on the Web and your purchase is delivered by FedEx. Sites such as StubHub and RazorGator (the latter is financed by Al Gore's venture capital firm, Kleiner Perkins Caufield & Byers) make considerable sense. Ticket reselling sites are convenient, allow comparison shopping and greatly reduce, although do not eliminate, the risk of counterfeiting. Most sports fans are glad StubHub and similar services have evolved. Some people would pay 500 bucks to see Hannah Montana, although the Page 2 staff probably would not. But the more respectable ticket reselling becomes, the more likely those who print the tickets in the first place are to want to control this action. If a $50 face-value ticket for a New England game, or for a Hannah Montana concert, is scalping for $500, why shouldn't the teams or concert producers pocket the premium? They, after all, are creating the value -- setting aside that "value" is in the eye of the beholder, especially in regard to pop music. Today, nearly all tickets for sports teams, Broadway shows and concerts are sold at the face price by teams and producers. There is some business logic in selling your tickets at face value. For one, it's a good public relations move. For another, face-value selling places the risk of declining ticket worth in the hands of the purchaser. On a free-bidding basis, tickets may be worth more or less than the face amount. Last week, tickets for the Steelers at Patriots game were rising in value; StubHub offered seats at that game for $250 to $2,245 each. But tickets for woofers such as Sunday's Rams at Bengals game and Monday night's cover-your-eyes Saints at Falcons game were declining in value, going on StubHub for as little as a few dollars each. Sports teams and theatrical producers that use conventional face-value sales avoid the downside risk of declining prices. But mostly, sports teams and concert producers have long sold tickets at face value in order to support their assertion that scalping is wrong and ought to be illegal. Many states enacted laws either banning ticket reselling or forbidding reselling within a certain distance of the entrance of a venue. These laws supposedly were passed to preserve public order, but that was pretense. Many were enacted at the behest of sports teams or Broadway promoters, who both wanted the face-value price of their tickets to set the market and were driven crazy by the thought of a scalper ending up with more income from a ticket than they themselves would realize. Shortly after setting up shop in Minnesota, for example, the Twins lobbied the state legislature to ban ticket scalping, which it did in 1963. By the 1970s, most states had anti-scalping laws. That's why brokers held up fingers near the gates of sports events. To hold up a sign saying "I NEED TICKETS" or "TICKETS FOR SALE" was, in many cases, illegal. Roughly five years ago, as the Internet brought ease to ticket brokering -- and physically removed the practice from the view of beat-patrol officers near stadia -- sports clubs and producers began to reassess their positions. The Internet made bans on ticket reselling unenforceable; so if you can't beat them, join them. Major League Baseball and National Hockey League teams began to allow season-ticket holders to resell game tickets through affiliate sites such as Ticketmaster; here is the New York Rangers' reselling page. Easy, legal reselling of tickets you won't use makes buying season-ticket packages more attractive, and thus helps clubs promote season-ticket sales. Joining the Internet wave, rather than bucking it, also allows sports teams and theatrical producers to offer convenience. The Cleveland Cavaliers, for example, have a paperless ticket option: Season-ticket holders can use a credit card or other ID for games, so there is no ducat to worry about. In the past two years, NFL teams have joined the StubHub World trend, though in patchwork fashion. The Redskins, Texans and Chargers, for example, began providing ticket-reselling links via StubHub; the Giants started a business relationship with Ticketmaster; and the Seahawks signed up with RazorGator. Here is the Seahawks' logo on a page from RazorGator, which calls itself the Official Fan Ticket Exchange Partner of the club. Two teams, the Bears and Ravens, partnered with this site to allow a secondary market in personal seat licenses. What pro sports once viewed with horror, or even called the cops about, suddenly became an approved practice -- despite vestigial small-type warnings on the backs of many tickets claiming to forbid resale. By early 2007, of the 32 NFL teams, only the Patriots and Steelers had no alliance with a ticket reseller. Get them while the NFL still sells them at face value! As pro sports has embraced Internet reselling, state laws have been altered. In the past two years, for example, Florida, New York and Minnesota have legalized ticket reselling, making it fairly obvious that the bans were a favor to sports owners all along. Only a few states still criminalize ticket scalping, among them Massachusetts. As recently as 2006, the Patriots sued 52 season-ticket holders for offering their tickets, at more than face value, on StubHub. Imagine if Detroit tried to tell customers they were forbidden to resell their cars! At any rate, just 18 months later, New England is expected to embrace a leaguewide reselling deal, assuming one happens -- although the new agreement is expected to specify that Patriots tickets cannot be resold for more than face value, to comply with Massachusetts law. Until such time as scalping becomes legal in the Bean State, too, that is. Like many technological developments, ticket reselling via the Internet is impossible to argue with. But now that the NFL has switched sides and decided to join StubHub World instead of opposing it, teams will start to wonder whether they shouldn't just auction tickets directly. 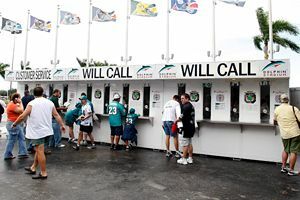 Imagine how high prices might skyrocket if hot teams such as the Patriots or Colts, or perennial-sellout teams such as the Broncos, Giants, Jets, Redskins, Chiefs or Steelers, took bids for their 2008 season tickets rather than selling them at face value. 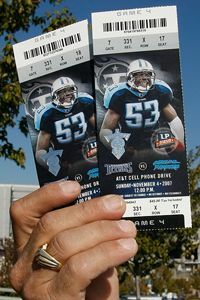 In some cases, season tickets contain contractual rights of renewal; this is why season-ticket holders of the Green Bay Packers can leave the tickets in their wills. But in other cases, clubs offer first-chance renewal to existing season-ticket holders as a courtesy. If the price is fixed at face value, why not offer first to the loyal customer? But if the price is what the market will bear, loyalty might go out the window, at least from the teams' standpoints. Brace yourselves -- a world in which sports teams and rock concerts sell many or all tickets for whatever the market will bear might be coming. It will be hard to dispute on free-market grounds, but brutal for anyone other than the affluent. Soon to be replaced with Internet auctions? For decades, sports teams have fought ticket brokering; in the past two years, they have switched sides and embraced the practice. Once sports teams seriously think through what StubHub World really means, they might find a way to impose major ticket price increases -- and say they are merely letting the market speak. In other football news, various conspiracy theories swirl around the game assignments the league makes for nationally telecast night contests on ESPN, NBC and now the NFL Network. Sometimes it seems as though the league is trying to play favorites; last week, when the NFL Network had Green Bay at Dallas, it seemed as if the league was trying to favor itself. The less interesting, nonconspiratorial reality is simply that no one can be sure, months in advance, which games will be monsters. Consider this week's NFL Network pairings: Denver at Houston on Thursday night, and Cincinnati at San Francisco on Saturday night. Yuck. Looking ahead, conspiracy theories regarding the regular-season finale Patriots at Giants game might prove unfounded -- as might the hope for a great game. Pats at Giants on the final Saturday night of the regular season is an NFL Network game, and it was circled by aficionados a month ago as a game that might pit a 15-0 New England team versus a Jersey/A squad desperately needing a W to reach the postseason. That sounds like great football, plus great promotion for the struggling NFL Network. But the Giants cannot win the NFC East, which Dallas just clinched, and hold a two-game lead over Minnesota for the No. 5 seed in the NFC. Jersey/A might lock in its playoff seeding before Week 17 and not only not care who wins the game against New England but rest starters for a first-round playoff appearance. In other football news, would New England actually be better off losing Sunday against Jersey/B? If the Patriots beat the Jets, they lock in the No. 1 seed and home-field advantage throughout the postseason. Then, with two meaningless regular-season outings and a bye week, a full month will pass until Jan. 12, the earliest date the Flying Elvii could appear in another game that counts. Consider New England's last three regular-season opponents: the 3-10 Jets, the 0-13 Dolphins and a Giants squad that might be resting starters. Even the mad-at-the-world Pats could have trouble maintaining focus for an entire meaningless month. Meanwhile, Dallas is in almost the same situation as New England. With effectively a two-game lead over Green Bay -- owing to beating the Pack head-to-head -- through the final three weeks, the Cowboys need only a combination of Dallas wins and Green Bay losses that adds up to two to lock up home-field advantage in the NFC. Thus, Boys faithful actually might root for Green Bay to beat St. Louis on Sunday -- otherwise it's possible the Boys could lock up the top seed this weekend, and face a meaningless month of their own. In holiday news, Christmas is economically inefficient -- Hanukkah, too. See below. Stat of the Week No. 1: Since last season's playoffs began, the Colts and Patriots have combined for just three losses -- and two came when they played each other. Stat of the Week No. 2: Since last season's playoffs began, the Dolphins and Jets have combined for just three wins -- and two came when they played each other. Stats 1 and 2 suggested by reader Adrian Larson of Ann Arbor, Mich.
Stat of the Week No. 3: Since taking the field for their final playoff appearances last season, a combined 28-6 at that point, the Bears and Ravens are a combined 9-19. Stat of the Week No. 4: So far, Buffalo is the only team to have played New England twice. The Bills averaged 47 points per game allowed against the Patriots and have allowed an average of 18 points per game against all other opponents. Stat of the Week No. 5: Baltimore was a leading-leading plus-17 for turnovers in 2006; currently, Baltimore is a league-worst minus-17. Stat of the Week No. 6: Kansas City was outrushed by 199 yards. Stat of the Week No. 7: Washington quarterback Todd Collins threw his first touchdown pass in five years, and he threw two touchdown passes in the same game for the first time in 10 years. Stat of the Week No. 8: In high school, college and now the pros, Derek Anderson is 3-1 as a starter against Kellen Clemens. Stat of the Week No. 9: At the end of the Cleveland-Jersey/B game, the Jets attempted three onside kicks in less than three minutes. Stat of the Week No. 10: Dallas has two victories this season in which the Cowboys didn't take a lead until the final 18 seconds or later. Please, Nicole, keep us after school for punishment! Makes the class quick learners! Sweet Play of the Week No. 2: Receivers running along the back line of the end zone sometimes get forgotten. Early in the Jacksonville-Carolina collision, Matt Jones was open at the back line of the Panthers' end zone, but the play did not work and Jax settled for a field goal. Reaching third-and-5 on the Carolina 6 later in the game, Jags' coaches called the same play; Jones along the back line of the end zone, touchdown and the rout was on. Sweet Special-Teams Plays of the Week: Trailing 17-3 with 10 minutes remaining, San Diego punted on fourth-and-29 at the Tennessee 40. Chargers special-teamers downed the ball at the Titans' 1, then the defense forced a three-and-out. Quick San Diego touchdown, and suddenly it's a game. In overtime, Chargers special-teamers downed a punt on the Tennessee 2. San Diego forced a three-and-out and went on to victory. Sour Special-Teams Play of the Week: Taking a 20-7 lead over Dallas with 1:46 remaining in the first half, Detroit inexplicably launched a pooch kickoff that came down at the Cowboys' 22 and was returned to the 35. Pooch kickoffs are used to prevent long returns in the closing seconds of a half; there was plenty of time remaining, plus Dallas had all three timeouts! Dallas drove down the field and scored to make it 20-14 at intermission; Detroit went on to lose by one point. Sweet 'N' Sour Play: Rare is the game in which a defensive tackle gets an interception; in the Minnesota at San Francisco collision, both Vikings' defensive tackles, Pat Williams and Kevin Williams, intercepted passes. That was sweet. Attention, San Francisco quarterbacks, you threw two interceptions to defensive tackles! That was sour. Sweet 'N' Sour Randy Moss Set: Football types call it a "double pass" when a lateral goes to a wide receiver who then throws deep -- the name sticks although of course there is only one true pass. New England ran a double-double pass. Leading Pittsburgh 17-13 on their first possession of the second half, the Pats had first-and-10 on their 44. Tom Brady threw a long lateral to the right to Moss, who dropped the ball, then immediately picked it up. Accidental or deliberate? Bill Belichick would know that a fumble causes the defense to break contain and rush to the ball. Moss lateraled back to the left to Brady, who threw a 56-yard touchdown pass to Jabar Gaffney -- another one of those guys who was terrible until he pulled on a Patriots jersey -- and you could hear the air rushing out of the Steelers' balloon. Mr. Guarantee, safety Anthony Smith, let Gaffney go deep. Just a couple of weeks ago, I was telling the safeties of my county-league, middle school team: When a receiver is sprinting purposefully deep on a play that looks like a run, it means he knows something you don't know. Anytime a receiver is sprinting at full speed in this situation, assume a trick play! Anyway, New England's action was among the sweetest of the year. Earlier, with New England leading 7-3 with first down on its 37, on the first snap of a possession, Brady play-faked and Moss ran a post. Cornerback Ike Taylor and Mr. Guarantee simply let Moss go by, neither one covering him. To that point, Moss had 18 touchdown receptions on the season. Why should we cover a guy headed deep who has 18 touchdown receptions? Now he has 19 touchdown receptions. Sour, sour play by a team that was boasting before the game, not after. I Am Not Making This Up: On Wednesday, the Maryland counties around Washington, D.C., area received 2 inches of snow. As a result of the snow, the city of Gaithersburg, Md., canceled part of its winter festival for the day. 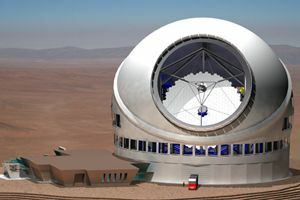 This planned new telescope is, technically speaking, ginormous. Astronomy Is Looking Up:A few months ago, TMQ proposed that the golden age of astronomy is about to begin. The Hubble Space Telescope, the decade-old Keck telescopes in Hawaii, the Very Large Telescope array recently completed in Chile and other advanced instruments give astronomers many times the stargazing power of a generation ago. The Giant Magellan Telescope and James Webb Space Telescope, expected in about a decade, will add another big leap in stargazing power, and the proposed Large Synoptic Survey Telescope, broadcasting its images live over the Web, would democratize astronomy by allowing anyone to do primary research using an advanced instrument. Last week, a private foundation gave $200 million in seed money for the proposed Thirty Meter Telescope, which would be a monstrously huge stargazing machine. Sponsored by a consortium of universities, the Thirty Meter Telescope would have a larger aperture than any existing instrument, plus these kinds of advanced features: "The TMT [adaptive optics] system will use six laser beams to create six luminous spots in a layer of sodium atoms high in Earth's upper atmosphere. These bright artificial stars [will] serve as references for measuring the turbulence in the atmosphere, allowing the AO system to compensate for blurring of starlight by Earth's fluctuating atmosphere." In the next decade or two, men and women are likely to learn more about the heavens, and about the possible origins of the universe, than has been learned in all of human history so far. It's just a cataclysm that could end all life. Probably won't happen soon. Don't get nervous! 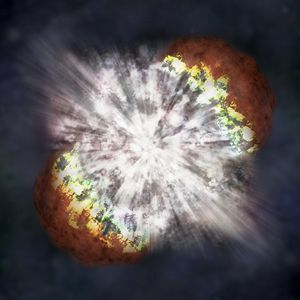 Creepy Cosmic Thought: One unfortunate discovery that might result from the coming golden age of astronomy is that supernova detonations represent more of a threat to life than previously assumed. About a year ago, astronomers observed an extremely bright supernova, five times stronger than the previous strongest known supernova; the explosion occurred 240 million light-years away in a distant galaxy. Astronomers at the University of California at Berkeley estimated the exploding star had 200 times the mass of our sun and was a blue star -- fastest-burning kind -- similar to the very large, powerful blue stars thought to have dominated the universe in the initial eon after the Big Bang. The unusually strong supernova explosion did not happen quickly, as with previous supernovas; rather, it seemed to build up over a matter of weeks and continue for several months. Had this supernova detonated in our galaxy, the Milky Way, extreme levels of radiation from the explosion might have ended all life on Earth or on other Milky Way worlds that might be inhabited. Here's what creeps me out. Eta Carinae, a gigantic double star similar in mass to the distant supernova star, is located "near" the Earth in cosmic terms, about 7,500 light-years away. Eta Carinae is burning with extreme intensity and startled astronomers 164 years ago by giving off intense light, in what is now considered to have been some kind of failed-supernova event. If Eta Carinae detonates in a supernova similar to the one recently observed at intergalactic distance, the radiation could sterilize worlds all over the Milky Way. Maybe Earth, maybe not; radiation from supernova explosions expands in streams from a star's poles, so it is more likely to miss you than hit you. On the other hand, roughly 10 superlarge blue stars similar to Eta Carinae already have been found in the Milky Way, and improvements in astronomy might lead to more such finds. If it turns out the Milky Way is seeded with the equivalent of cosmic land mines, our existence here might seem even more improbable, and more tenuous. Best 99-Yard Drive: The Saints have seemed out of the picture for so long that it's weird to wake up two weeks before Christmas and realize they have a healthy shot at the playoffs. New Orleans finishes at home against Arizona and Philadelphia, then on the road versus Chicago. Standing 6-7, the Saints must pass the 7-6 Vikings to grab the No. 6 seed in the NFC. Given that the 6-7 Cardinals are also alive for the No. 6 seed, Sunday's New Orleans-Arizona game is very important -- and who thought that would be said of a late-season New Orleans-Arizona game in our lifetimes? (Sunday's Buffalo-Cleveland contest is also the first important Browns-Bills game since 1989.) If New Orleans can defeat Arizona, its final two opponents will be demoralized teams likely to have been eliminated before kickoff, giving New Orleans a realistic shot at 9-7. Minnesota can finish 10-6, and Washington and Detroit also have shots at 9-7 -- and it's way too early to start poring over the tiebreaker formulas. Still, New Orleans has hope, owing to being in the NFC. The AFC clubs at 6-7, Denver and Houston, are all but eliminated. And one of them will be officially eliminated after they meet Thursday night. With the "Monday Night Football" game scoreless, New Orleans took possession on its own 1-yard line. Immediately, Drew Brees retreated into his end zone, just like Tom Brady! Brees even got Brady-class protection as he completed a pass. The Saints' play calls on the 99-yard touchdown drive: Pass, pass, pass, pass, pass, pass. How Patriots-like! New Orleans is fourth in the league in passing, and its offensive line has surrendered fewer sacks than the New England and Indianapolis offensive lines, which have been praised constantly by TMQ. (Indianapolis and New England have played a much tougher schedule than New Orleans, though.) That Brees once again is performing well reminds us that the Dolphins are 0-13 in no small part because team management made disastrous quarterback decisions in two consecutive offseasons, passing on Brees in 2006 and passing on Brady Quinn in 2007. As for Atlanta, it was first in the NFL in rushing in 2006, but is now 26th after running for just 37 yards at home Monday night. It's important to look for positives, though. So on the upside, bear in mind that the Falcons' training facility has not been hit by a comet this season. The Gift Card Conspiracy: Not only is there too much commercialization at Christmas, there's too much economic waste! In 1993, economist Joel Waldfogel memorably calculated the "deadweight loss of Christmas" -- the difference between the amount givers spent on gifts and the value to recipients. For instance, if you spend $100 to give someone a nice coat, but the person already owns three nice coats, the gift might have only $50 in value to the recipient, and thus in economic terms, $50 is lost. If you spend $100 to give someone a monogrammed fish slice and the recipient does not want a monogrammed fish slice, all $100 is lost. Of the "deadweight loss of Christmas," Waldfogel concluded, "between a tenth and a third of the value of holiday gifts is destroyed by gift-giving." Christmas -- too much egg nog, too many gift cards. Gifts destroyed by giving! That surely does not sound festive. So isn't the gift card the solution? The magnetic-stripe gift card has gone from unknown to ubiquitous in a mere decade. Mobil Oil offered the first magnetic gift card in 1995; a few years later, gift-card sales were still negligible; this year, analysts project at least $80 billion worth of stripe-bearing gift cards will sell. 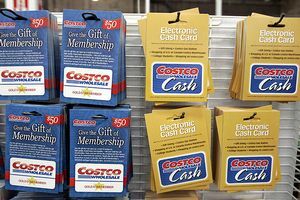 Gift cards have essentially eliminated the taboo against cash as a gift. Once, you weren't supposed to give cash because that revealed how much you spent on the gift. With gift cards, the amount spent is always revealed, yet somehow no longer matters. And since a $100 gift card is worth $100 to the recipient, these cards ought to eliminate economic losses associated with Christmas and Hanukkah gifting. In a recent paper in the Journal of Economic Perspectives, Professor Jennifer Pate Offenberg of Loyola Marymount University begged to differ. She found that some economic value of gift cards can indeed disappear -- if the recipient loses the card or forgets to use it, or because gift cards restrict the recipient to a particular merchant he or she might not otherwise patronize. Economic welfare losses average about 15 percent for gift cards, Offenberg calculates -- meaning if $80 billion worth are sold this year, $12 billion goes straight up the chimney. Twelve billion dollars lost for nothing: Why, that sounds like a day's work for Congress! To put the figure into perspective, $12 billion is three times the amount raised in 2006 by the United Way, America's most successful charitable fundraiser last year. Economic losses associated with gift cards would be avoided, Offenberg maintains, if givers simply gave cash -- because cash can be used anywhere and it is nearly unheard-of for people to forget to spend their cash. Why have gift cards become so popular? Offenberg supposes that working moms are too busy to shop and our consumerist culture says it's better to give someone the means to select precisely what he or she wants than to present a gift that may or may not be what the recipient desired. But I think she's missing other benefits of the cards. In just the past five years, my kids have gone from elaborate shopping for birthday gifts to giving gift cards under all circumstances -- as well as wanting gift cards on their birthdays. Gift cards aren't merely convenient; they reduce psychological losses. By eliminating embarrassment to the giver at giving something the recipient either already has or doesn't want, and eliminating embarrassment to the recipient for failing to act sufficiently pleased regarding a gift, gift cards make holidays and birthdays less stressful. And gift cards can be combined, which is efficient in economic terms, if the recipient would rather have one expensive item than lots of less expensive things. Tuesday Morning Quarterback sees the magnetic-stripe gift card as rivaling the wheel, fire and the pop-top as achievements in human progress. Though, obviously, companies are hoping you lose the cards or forget to use them. Awesome Detroit Lions Roll Toward Playoffs: (Item faces cancellation owing to writers' strike.) After rushing for a total of 164 yards in their previous four games, all losses, the Lions rushed for 152 yards against the Cowboys. That seemed to do the trick, as Detroit led 20-7 late in the second quarter and 27-21 late in the fourth. But when you represent the city that thinks the 12-mpg SUV is the vehicle of the future, you find a way to lose. In Houston, the only hope is for the cheerleaders to appease the football gods. Detroit special-teams and blitz mistakes are noted elsewhere in the column. With Detroit leading 27-14 at the start of the final quarter, Dallas went for it on fourth-and-goal from the Lions' 1. Marion Barber ran up the middle untouched for a touchdown. The blocking was great, especially a short pull by twice-waived guard Kyle Kosier, whose name will appear in a few weeks on TMQ's All-Unwanted All-Pros. But think about it, a runner goes up the middle untouched on fourth-and-goal. With Detroit leading 27-21 with 1:28 remaining and the Cowboys out of timeouts, Tony Romo was sacked and fumbled. If a Lion simply falls on the ball, the remainder of the game is kneel-downs for a Detroit victory. Instead, linebacker Paris Lenon tried to scoop and score, wanting a stat-padding touchdown; he booted the ball, and Dallas got the fumble back. Now, Dallas has reached the Detroit 16 with 22 seconds showing on the clock. To that point in the game, 'Boys tight end Jason Witten had 14 receptions for 122 yards. This is what is called "a clue." As the Cowboys broke the huddle, TMQ said aloud, "Maybe it's to Witten." It was, for the winning touchdown; linebacker Ernie Sims was covering Witten, who easily got clean on the down-and-in seam, Witten's favorite pattern. Law of the Obvious Dooms Titans: TMQ's Law of the Obvious holds: Sometimes, all a team needs to do is run up the middle for no gain and things will be fine. Leading San Diego 17-10, host Tennessee faced third-and-4 on the Chargers' 46 with 2:37 remaining and San Diego down to one timeout. Run, grind the clock! Instead, incompletion, and San Diego scores to force overtime with nine seconds remaining. Had the Flaming Thumbtacks simply rushed up the middle for no gain, keeping the clock moving, the Chargers would have run out of time. Stop Me Before I Blitz Again! With Philadelphia leading Jersey/A 10-6, the Eagles blitzed seven, and a short slant to Plaxico Burress became the touchdown that supplied the Giants' winning points. Before the snap, with defenders crowding the line, Eli Manning took a stance, then stepped up toward the line and pointed at men to be blocked, then stepped back; the Jersey/A center rocked up and pointed, and one Giants guard rocked up and pointed. Indianapolis and Peyton Manning get away with an awful lot of what looks like illegal motion during the Manning family presnap chicken dance. On this play, the Giants were practically square-dancing before the snap! Stop Me Before I Blitz Again! No. 2: With Detroit leading Dallas 20-7 with 33 seconds remaining in the first half, the 'Boys had first-and-10 on the Lions' 8, holding a timeout. Detroit coaches called a seven-man max-blitz. But suppose this blitz succeeds -- even after a sack, Dallas is still in close field goal range. So what was the point of opening the door for a touchdown? Which happened when Tony Romo, fading backward to the 18, flicked a perfect pass to Marion Barber, who walked in untouched. He invented the personalized royal plural pronoun. We Are Not Amused: It's bad enough that many politicians, athletes and celebrities use the royal "we" when speaking of themselves. Is it because they don't understand language or because they think they actually are royalty? Last week, Mitt Romney dove further into this pretentious nonsense by referring to himself as "we personally." Asked about illegal immigrants doing his landscaping while he is off denouncing others for not stopping illegal immigration, Romney said in Meredith, N.H., that he had been double-crossed by a landscaping company that claimed to employ only legal workers. 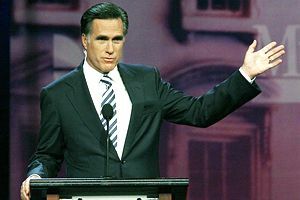 Romney went on to declare that "we personally" met with the owner of the landscaping firm to insist on legal workers. "We personally"! Mitt note: This summer, Romney said his favorite novel is the Battlefield Earth series by L. Ron Hubbard, founder of Scientology. If you saw the really awful John Travolta movie "Battlefield Earth" and assumed it was another example of a movie not as good as the book -- actually, the movie was much better than the books, which number among the worst dreck ever to leave a printing plant. Just to prove it was no fluke, Hubbard also wrote this really terrible theme music for the Battlefield Earth series. Are the aliens from "Battlefield Earth" making illegal campaign contributions? Baltimore -- This Year's Train Wreck Team: From the point at which they attained a fourth-quarter lead against the undefeated Patriots, the Ravens have been outscored 54-20 at home, dropping consecutive night dates to the Pats and Colts in just six days. When the 2007 sked came out, Ravens faithful looked at these consecutive national-TV home games as an avenue of glory; instead, this stretch became a dark siding on which the train derailed. (Note to ESPN metaphor department: Please check.) Since taking the field in January for a home playoff game with a sparkling 13-3 record and favored by many to win the Lombardi, Baltimore is 4-10. The Ravens briefly looked like their old selves against the Patriots, then stunk against the Colts. How can a team go from 13-3 to needing a housecleaning in a mere 11 months? As for Indianapolis, the defending champion Colts continue to look just slightly less good than the Patriots -- third in points scored, third in points allowed. New England required all 60 minutes to defeat Baltimore; the Colts were ahead 23-0 at the end of the first quarter. If you were the defending champs, you might be happy to have all the focus on Belichick's charges as the postseason approaches. Like New England, Indianapolis seems to have magic jerseys: Put one on, and instantly you're good. Coming up to the 2007 draft, scouts were ho-hum about left tackle Tony Ugoh, a second-round pick from Arkansas; as a Colts starter, he is already one of the best offensive linemen in the league, and moves laterally as well any NFL left tackle. (See his great lateral-movement block on the Joseph Addai run that made it 30-0.) Indianapolis is playing so well the Colts blocked a punt out of the end zone for a safety despite rushing six; usually, an eight-man rush is required for a punt block. Unlike with New England, there's no running-up-the-score mania on the Indy coaching staff. Midway through the third quarter, Jim Sorgi came in for Peyton Manning; Sorgi spent the rest of the game handing off to the legendary Clifton Dawson. Most Indianapolis starters left the game midway through the third, and Tony Dungy did not seem to care one whit that Baltimore closed the final margin from 44-7 to 44-20. Best Blocks for Players Named Taylor: No one touched Fred Taylor as he ran 80 yards for a touchdown against Carolina; it's pretty fun to run 80 yards when everyone in front of you already has been knocked to the ground. It was an off-tackle left, and the left side of the Jax line -- Khalif Barnes and Vince Manuwai -- plowed the road. A couple hours later, no defender got a hard hit on Chester Taylor as he ran 84 yards for a touchdown against San Francisco. It was an off-tackle left, and the left side of the Minnesota line -- Bryant McKinnie and Steve Hutchinson -- plowed the road. Note: Minnesota won by 20 points despite recording only 11 first downs. In Hell's Sports Bar, They Start Playing Christmas Music on December 26th, Then Stop on Thanksgiving: Hell's sports bar has 28 wide-screen HD TVs, and every Miami Dolphins game is shown live. On Sunday, patrons endlessly saw a highlight clip of Miami, 0-12 and trailing by 14 points in the second half, punting on fourth-and-4 in Buffalo territory. Why Certain Teams Are 0-13: One reason the Dolphins are foundering (if they were fish, not marine mammals, they could be floundering) is the quarterback carousel -- 11 starters in the past five seasons, plus starters yanked thrice this season. It increasingly appears as though Miami coach Cam "Cam" Cameron made a blunder of epic proportions by passing on Brady Quinn in the 2007 draft, missing his chance to end the franchise-quality quarterback drought in Miami that began when Dan Marino retired. There's another level of the Dolphins' quarterback carousel. Reader Walter Stephens of Newman, Ga., points out that six of the quarterback starters Miami has given up on recently have gone on to start somewhere else -- Daunte Culpepper with the Raiders, A.J. Feeley with the Eagles, Gus Frerotte with the Rams, Joey Harrington with the Falcons, Damon Huard with the Chiefs, Sage Rosenfels with the Texans. None of these dismissed Dolphins' quarterbacks has torn up the league, but perhaps if Miami had stuck with one of them, instead of endlessly changing jockeys, things wouldn't be quite so bad. Dolphins quarterback bonus: Cleo Lemon, playing in relief of John Beck (note to ESPN fact-checking department: Did this occur in the NFL? ), heave-hoed an interception off a play fake. Watch the tape; Lemon play-faked to his right, where there was no running back -- he play-faked to the air. Scouts Notes: Dallas scored two of its four touchdowns in the final ticks of the first and second halves at Detroit, getting touchdowns at 29 seconds in the first half and 18 seconds in the second half. In the Dallas comeback at Buffalo, the key was scores in the final ticks of the first and second halves. Tony Romo seems to come to life in the closing seconds of halves; defensive coordinators need a plan for this. Play to Win, Not to Keep the Loss Margin Respectable! It's hard to believe the Joe Gibbs-coached Washington Redskins met the power-running Chicago Bears and the teams rushed for 91 yards combined. Chicago's inability to run the ball has been central to its disappointing season, and TMQ continues to puzzle over why the Bears went out of their way last winter to unload power back Thomas Jones, an important cog in their Super Bowl appearance in February. Trailing 17-10, Chicago reached first-and-goal on the Washington 1 with seven minutes remaining. The Bears ran up the middle for a loss of 2, then went incompletion, incompletion, field goal. Ye gods! The Chicago Bears cannot rush for one single yard with the game on the line. TMQ's Christmas List: The Barbie fad lives on, so up-to-date that Ken is now a metrosexual apparently afflicted by gender confusion. Every Christmas, Barbies become more complex, expensive and fashion-conscious. Here is Barbie dressed to go down with the Titanic. Here is Barbie in a toy gown that costs more than many actual dresses. Here is Barbie looking suspiciously like a Jazz Age lady of the evening. And here is the Barbie we've all been waiting for -- a Barbie that's inappropriate for young girls. The disclaimer warns, "For the adult collector, age 14 and over." Don't mess with the eight-inch-high plastic Ray Lewis. Christmas List Addendum: TMQ will skip the Barbies, but hopes Santa brings him McFarlane sports figurines, which are well-made and reasonably priced. 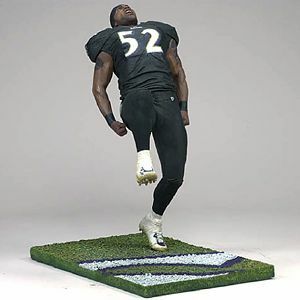 Here's Ray Lewis doing his pregame dance. My 12-year-old, Spenser wants the McFarlane Peyton Manning. McFarlane even makes figurines of offensive linemen; here's William Thomas in miniature plastic glory. Here is an entire miniature Bears offense. Incredible realism: No matter how much you yell at them, they won't go forward. Pittsburgh at New England Analysis: It's hard to believe a team could be outrushed by 158 yards at home and win easily -- which is what New England did against Pittsburgh. But then it's also hard to believe that, in a high-profile game, a team could throw for 399 yards against the NFL's No. 1 pass defense -- which is also what New England did against Pittsburgh. Patriots coaches called 47 passes (attempts plus scrambles) and eight rushes, and the strategy worked like a charm -- against the league's best pass defense. Tom Brady has 45 touchdown passes against five interceptions, a 9-1 touchdown-interception ratio. This number is just hard to believe, given that great quarterbacks hope for a 2-1 touchdown-interception ratio. Brett Favre, for instance, has 438 career touchdown passes and 284 career interceptions. Such is even Brady's normal ratio; he has 192 touchdown passes versus 83 interceptions for his career. Take away this season, and Brady has 147 touchdown passes and 78 interceptions, not quite a 2-1 ratio. In 2007, he is 9-to-1. It's hard to believe. Not, as announcers say, "unbelievable!" I do believe it -- just find it hard to believe. The Patriots dared the Steelers to penetrate their magnificent offensive line -- and Pittsburgh couldn't come close. At the risk of sounding like a broken record, Tuesday Morning Quarterback continues to feel the key to New England success is magnificent offensive line play. The Steelers zone-blitzed most of the game, often rushing five, occasionally rushing six; and though Brady was knocked down thrice, he was never sacked and only twice was he forced to throw the ball away to avoid a sack. At one juncture, New England took over on its own 1. The Flying Elvii came out empty backfield -- on their goal line against the league's best defense! Pittsburgh rushed five. Brady stood calmly in the end zone, with no Steelers rusher so much as coming close to him, and completed a 22-yard pass. Bill Belichick all but begged Pittsburgh to sack his quarterback for a safety, and the Steelers' rush could not get close. The New England offensive line both plays very well and never, ever, ever stands around watching the play. In almost every NFL game, if you fix your gaze away from the ball, you will see instances -- sometimes many instances -- of offensive linemen who never block anyone at all or who brush their man once, then simply stand around and watch. When the Flying Elvii offense is on the field, you never see this. New England offensive linemen go all out until the whistle sounds. And they don't crane their necks around trying to figure out where the ball is -- a common offensive line mistake -- but rather look straight ahead and focus on their men. Why can New England get its offensive line to use perfect fundamentals, yet so many other teams cannot? As for the Steelers, they came after Brady with pressure but let his receivers off the hook by not jamming. On most downs, the Pats' wideouts got a 6-to 8-yard cushion; Brady threw hitch, slant and quick out after hitch, slant and quick out, and Pittsburgh never adjusted. Didn't the Steelers see the game film in which Baltimore showed that jamming receivers disrupts the New England passing attack? Backed-off coverage did not even stop big plays; Brady threw for the second-most yards in his career. Pittsburgh did not exploit its best advantage: running, both for yards and to control the clock. New England leading 14-10 in the second quarter, the Steelers reached third-and-2 on the Patriots' 26. Pittsburgh came out in a shotgun spread. "Arrrggghhh, just hand it to Parker, what are they doing?" shouted Spenser. ("Arrrggghhh" is an exact quote.) Incompletion, and not on an attempt for a big play but rather on a dinky-dorky short throw. Pittsburgh settled for the field goal, and New England began to smell blood. Then, with the Pats leading 31-13, the Steelers had third-and-goal on the 1 at the start of the fourth quarter, a must-score situation. Willie Parker already had 100 yards to this point and was averaging 5.6 yards a carry. Did he get the ball? Incompletion on a fade pattern, then a mincing trick play that forced Hines Ward to run sideways rather than straight ahead. TMQ wrote the words "game over" in his notebook. The cheer-babes brought their "A" game at Jacksonville, and the football gods smiled. Leftover Scalping Points: Nobody knows tickets like Ticketmaster, which sold 128 million tickets in 2006 despite its nerve-racking anti-bot countdown clock and its infuriating promotional e-mails that seem impossible to turn off. For reselling of game seats, Ticketmaster has a clever idea to eliminate tickets lost in the mail: The company will simply void the bar code of the original ticket and e-mail a new ticket, with valid bar code, to the buyer. That way, the seller can't lose and the buyer gets the ticket almost immediately. Recently, the attorneys general of Arkansas and Missouri filed suit against a company that made bot software designed to attack the Ticketmaster Web site and bid for Hannah Montana tickets; the bot company planned to snap these tix up, then resell them. In October, a federal judge issued an injunction to stop a Pittsburgh company from using a similar bot to attack Ticketmaster, saying this violated the Ticketmaster terms of purchase. Sellers should be able to enforce terms of purchase. If the terms include, "This ticket is offered for sale to members of genus Homo only, not to software programs," injunctions are justified. I'd go further and issue an injunction against Hannah Montana. But why do tour promoters care if bots buy the tickets for brokers; don't promoters only care that the seats get sold? The Hannah Montana tour has been marketing about half its tickets as "holdbacks," specials to dues-paying club members. That is, the promoters want the resale premium, in the form of getting you to pay dues to a Hannah Montana club to qualify for the holdback queue. Mark my words, this is the beginning of rock concerts and sports teams direct-auctioning tickets for whatever the market will bear. More Proof of the Decline of Western Civilization: On Dec. 6, Todd McShay posted ESPN.com's first April 2008 mock draft. McShay has the Dolphins picking Glenn Dorsey of LSU first overall. Notice who picks second in his mock draft (Insider subscription required) -- the New England Patriots. In the draft this spring, already having a strong 2007 roster and two first choices, Bill Belichick banked one of the firsts for San Francisco's first in 2008. At the time, few would have guessed how spectacularly bad the Squared Sevens would be this season -- perhaps Belichick was behind that somehow because now the Pats project to the second overall choice. When Roger Goodell fined the Patriots a first-round choice in the Beli-Cheat scandal, it was New England's first-rounder, not the San Francisco choice acquired in trade, that Goodell voided. Belichick obtained San Francisco's first choice fair and square, and his decision to bank that choice reflects the wise husbandry New England has shown consistently under current management. Still, if the Patriots win the Super Bowl, then go second in the 2008 draft after Goodell publicly imposed what sounded like a harsh draft penalty, the situation will seem rigged, even if it isn't. The Football Gods Chortled: At the end of 2005, bumbling head coach Mike Mularkey quit the Bills and went to Miami as offensive coordinator. Neil Easterbrook, an Official Brother of TMQ and a die-hard Bills fan, immediately pronounced: "This is great, now Mularkey will coach against Buffalo twice a year and do just as bad for the Dolphins as he did for us." And yea, verily, it came to pass! Since then, Buffalo has beaten Miami four straight and outscored the Dolphins 88-33. Miami's crafty, cagey, canny Cam "Cam" Cameron even assigned Mularkey, now the Dolphins' tight-ends coach, play-calling duties coming into Sunday's game at Orchard Park; Buffalo led 21-0 before the end of the first quarter. Note to Wayne Huizenga: Neil requests that you don't ever fire Mike Mularkey. Single Worst Play of the Season So Far: The Green Bay secondary was holding this distinction, but on Sunday, it passed the torch to the Oakland secondary. Raiders' defensive backs gave up far too much easy yardage after the catch to Green Bay receivers, including a 37-yard completion to underwhelming Koren Robinson, a play on which an Oakland corner two-hand-touched Robinson after the catch, then watched him take off. Now it's Green Bay 17-7 and the Packers have the ball on their 20 for the first play of a possession. As TMQ has noted, Green Bay and New England like to throw deep on the first play of a possession. And let's see, they are first and second in passing, so maybe this is a good tactic. Anyway, even though part-time football columnists know Green Bay likes to open a possession by throwing deep, Oakland didn't know it. Speed threat Greg Jennings was single-covered deep, no safety anywhere in sight; he could have walked the final 40 yards of his 80-yard touchdown reception. Oakland Raiders, you are guilty of the Single Worst Play of the Season So Far. Thomas Addison of Quince Orchard High outruns five guys to the Maryland 4A title. At least somebody from Maryland looked good in the Ravens' stadium this week! Why Tactics Matter: The Cheerleader of the Week comes from my kids' school system, and so does the new Maryland 4A (largest class in Maryland) state champion, Quince Orchard High. In a game held at M&T Bank Stadium, where the Ravens play -- even liberal, really blue states like Maryland are now boosting high school football like crazy -- Quince beat Arundel High for the crown in a game with an interesting tactical twist. Arundel, with the state's top passing offense based on a hurry-up no-huddle, attained a 23-7 lead at the end of the third quarter, then started running to grind the clock. So far, so good. Because high school football uses 12-minute quarters, a two-touchdown lead with a quarter to go usually is secure if you run the ball to shorten the game and don't fumble. But Arundel was rushing from the hurry-up no-huddle, racing to the line to quick-snap for runs. The point of switching to rushing was to grind the clock! Arundel doesn't run particularly well, and it staged consecutive three-and-outs that, owing to the hurry-up set, each took less than two minutes off the clock. Leaving, as you've guessed, time for Quince Orchard to rally for a 36-30 victory. High school update: Pulaski Academy of Arkansas, touted in a TMQ as being a team that never punts, lost in the state quarterfinals. This weekend, the Virginia Division 5 title was won by Stone Bridge High of Ashburn, another team that never punts -- Stone Bridge went for it four times on fourth down in the championship. Obscure College Score of the Week (Division I-AA semifinals): Delaware 20, Southern Illinois 17. Located in Carbondale, Ill., Southern Illinois declares, "Less than one year after graduation, 80 percent of our graduates are employed full time." Ouch -- only 80 percent? Division I-AA playoffs note: ESPN2 brought so many cameras to the Appalachian State-Richmond pairing that the Deuce was able to show three views of a disputed play. It wasn't long ago that prime-time NFL games didn't offer three views of a play! Television note: There was no NFL or NCAA Division I-A football game on television Saturday, surely a reason ESPN had so many cameras at Appalachian State-Richmond this weekend. But a Saturday in the fall with no NFL or big-college football game -- this is America, can this be legal? Obscure College Score of the Week (Division II semifinals): Valdosta State 28, California of Pennsylvania 24. Located in Valdosta, Ga., Valdosta State has both a College of Arts and Sciences and a College of the Arts. Obscure College Score of the Week (Division III semifinals): Mount Union 62, Bethel 14. Located in St. Paul, Minn., Bethel holds Christmas concerts in November. Note: Mount Union has outscored opponents 284-6 in the first quarter. But seriously, it's fair competition! Reader Animadversion: Got a complaint or a deeply held grievance? Write me at TMQ_ESPN@yahoo.com. Include your real name and the name of your hometown, and I might quote you by name unless you instruct me otherwise. Note: Giving your hometown improves your odds of being quoted. Wednesday: Readers' comments a week from tomorrow -- the readers' column has switched to running every other week. Next Week: StubHub offers to pay you to take tickets to Chiefs at Jets on Dec. 30. In addition to writing Tuesday Morning Quarterback, Gregg Easterbrook is the author of "The Progress Paradox: How Life Gets Better While People Feel Worse" and other books. He is also a contributing editor for The New Republic, The Atlantic Monthly and The Washington Monthly.